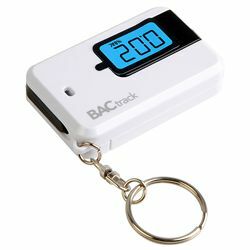 BACtrack Go is the smallest, sleekest accurate breathalyzer on the market. Advanced MicroCheck® alcohol sensor determines BAC quickly and accurately. The mouthpiece folds away to protect it while not in use. Proprietary sensing technology and a specially tuned algorithm, deliver accurate results unparalleled at this price point.